Mulhouse is an industrial town in the very East of France, near the border with Germany and Switzerland. It has transport museums dedicated to cars and railways. It joined the Swiss Federation in 1515 and remained associated with Switzerland until 1798, when the population voted in a plebiscite to become part of France. After the Franco-Prussian War (1870-1), it was annexed by Germany along with other parts of Alsace-Lorraine. In August 1914 the Battle of Mulhouse was the first French attack on the German army in an attempt to recover Alsace: the French occupied the town for 2 days before being forced out, and then regained the town a few days later, but again held it for only for a few days, as the French army withdrew to a more easily defended position. The citizens, who had welcomed the French warmly, suffered German reprisals. This stamp commemorates the 200th anniversary of the original incorporation of Mulhouse into France. 1998 was the 400th anniversary of the Edict of Nantes of 1598, in which Henry IV of France officially granted religious toleration to Calvinists in what was a predominantly Roman Catholic country. It was an attempt to end the French Wars of Religion between Catholics and Protestants, and is commemorated in this 1998 stamp on which Henry IV is depicted. The then Pope, Clement VIII, when informed of the Edict, is said to have responded, "This crucifies me". The Edict was revoked by Louis XIV in 1685, who declared Protestantism illegal and instituted a period of persecution, leading to a flood of Huguenots leaving France, many coming to London where, like so many waves of immigrants, they settled largely in the Eastern parts of the city. There is still a Huguenot church in Soho, central London (at one stage, there were over 20 such churches). The loss of skills and talent seriously damaged the French economy. It was only in 1787 that religious freedom and civil rights were restored to non-Catholics in France. I think the outline figures in the background are intended to be a Catholic priest and a Huguenot minister shaking hands. A stamp issued for the centenary of the Aéro Club de France in 1998. The socked-on-the-nose cancel is from Bièvres in the Essence Department of the Île-de-France. This 1998 stamp celebrates the work of Médecins Sans Frontières (Doctors without Frontiers), founded in France in response to the medical needs resulting from the Biafran War of 1967-70. The organisation is well-known for its work in war zones and amid epidemics in developing countries. It relies on volunteers, who come from many different countries, for its medical work, and they frequently expose themselves to considerable danger, with quite a number of casualties. It was awarded the Nobel Peace Prize in 1999. The words on the cartoon can be translated as "Later on I will be a Doctor without Frontiers." - "He [or it] really will have done everything for you." A 1936 semi-postal in aid of children of the unemployed. The kids are probably looking far neater and better-dressed than they ever actually were. A 1937 semi-postal showing families of postal workers engaged in a tug-of-war. A 1935 semi-postal showing a woman coming to the help of an unemployed intellectual. (Though the design could bear a romantic or a sleazy interpretation.) Note the creature in the left margin - I think it may be a monkey with an artist's palette round its neck, but I am not sure. 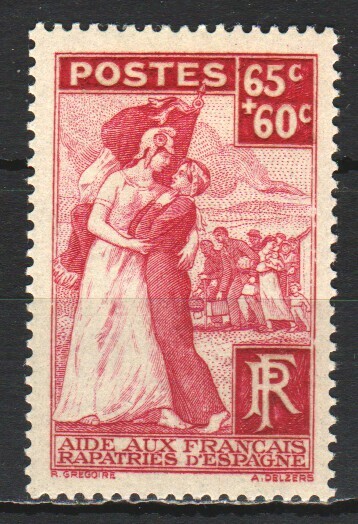 A 1935 semi-postal showing a female representing art - like the preceding stamp, from a set of two in aid of unemployed intellectuals. The words translate as "for art and thought". Wikipedia tells me that Mulhouse was an "independent Calvinist republic" within the Swiss Confederation; then it joined France in the middle of the Directory, a remarkable change if I ever heard of one. Wondering if Wiki left something out, I wandered around the Web a bit, but Mulhouse's official site, which is here, doesn't appear to have a historical summary. I did learn that the city's museum of contemporary art has the delightfully polyglot name of the Kunsthalle. I haven't really loved a lot of French stamps of the last 30 years, but I gotta say, avec plaisir, that you've posted some nice ones here. Jacques Callot (born in 1592, death year uncertain) was a French printmaker who produced more than 1400 etchings covering all manner of subject from ships to drunkards. He frequently did work for the court of the Medici in Florence and for other rulers. Here he is on a French semi-postal of 1936. 2 French semi-postals, of 1937 and 1939, in aid of the public health fund. A 1938 semi-postal showing a monument to members of the French military medical corps. 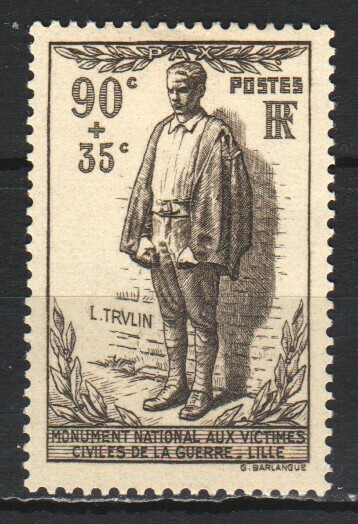 A 1938 set showing a French infantryman - semi-postal stamps to raise funds for a monument. A 1938 semi-postal in aid of a national fund to assist French refugees from the Spanish Civil War. The female figure symbolises France welcoming her children. A 1939 semi-postal in aid of victims of war. The figure is of a civilian facing a firing squad. Since I'm working on France, I am currently running through these stamps as well. Thank you! A 1939 set of semi-postals, for a fund encouraging people to have more children.